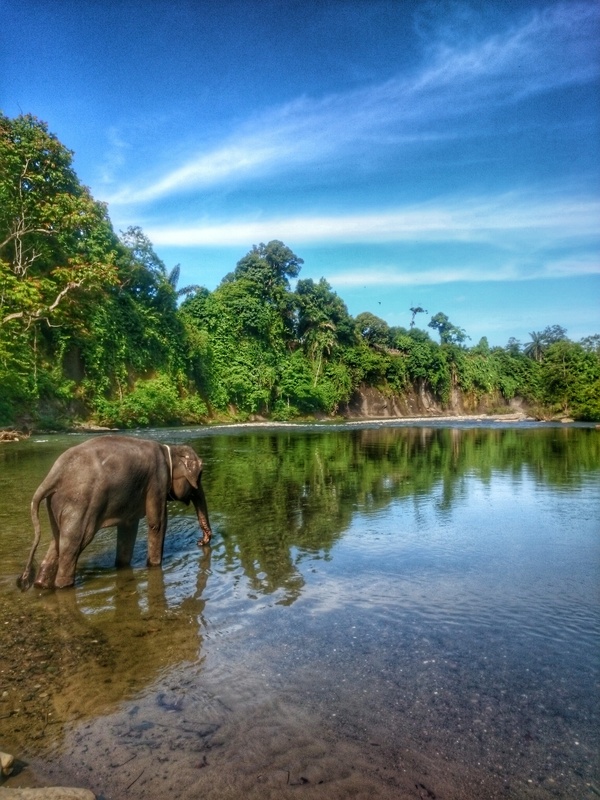 Dreaming of your next sunny holiday already? Tell me about it! 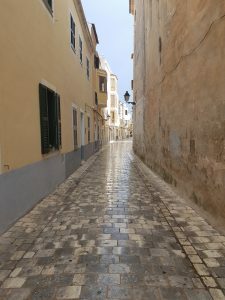 We had a fab week on Menorca in early autumn and found it was no problem being gluten free or coeliac on the island. 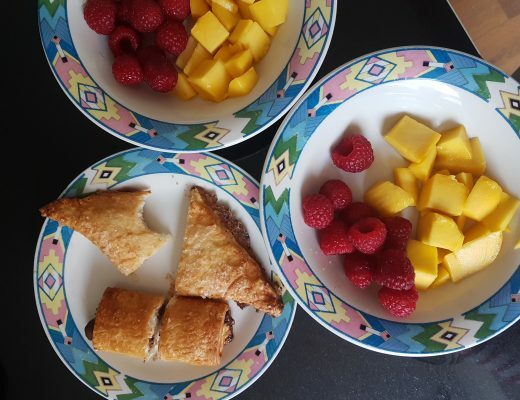 Every restaurant we ate knew how to cater effectively for gluten free and many restauranteurs reassured me that they often catered for coeliacs. 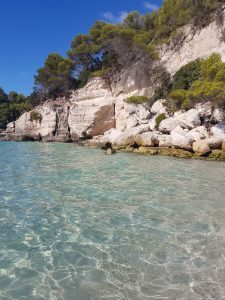 Here is my guide to gluten free Menorca. 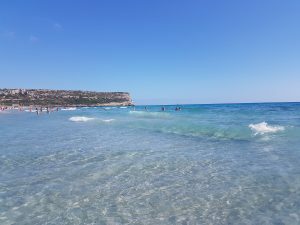 I have broken the information by town/area, then at the end you will find a section on Menorca’s gluten free supermarket options and details on eating gluten free at Menorca airport. C’an Bernat – Alaior was our local area, very conveniently placed 10 minutes’ drive from the airport but away from any flight paths. 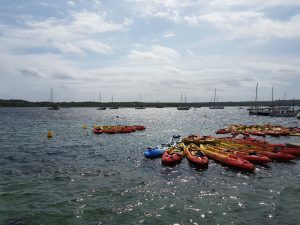 Rural, peaceful yet close to the main roads, I would recommend this part of Menorca if you enjoy exploring and want to make the most of your time on the island. While driving here and there we passed a little restaurant on a roundabout repeatedly. As it looked cute and was always bustling with people we eventually gave into our curiosity and headed there for dinner one evening. What a great decision! We ate local rice specialties, grilled meats and fresh vegetables. 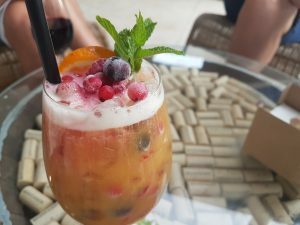 Piccolo Mundo – a bustling restaurant that is fairly touristy and not particularly worth going out of your way for but perfectly good if you are in the area or fancy a lunch away from the beach. 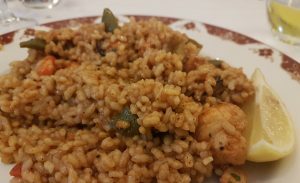 We ate gluten free paella and sizzling garlic chilli prawns. 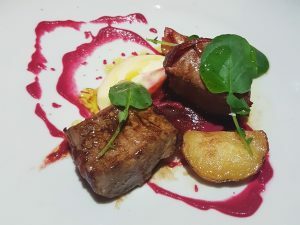 A recommendation I received from a number of people but didn’t get round to trying was El Pato in Cala En Bosch. Apparently they have a good array of gluten free dishes on offer (including gluten free pizza) and other coeliac travellers tell me they really rated it. The restaurant has a dedicated gluten free menu. One of the best beaches we found on the island. It is a bit of a walk from the car park, but the path leads down through forest so you don’t get frazzled by the sun en route. Restaurant Cala Mitjana – a popular spot where 90% of menu is suitable for coeliacs. 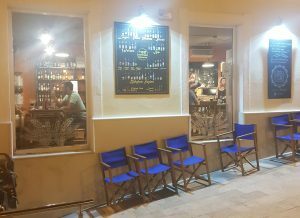 C’an Rafa – do an array of gluten free tapas and it was recommended to me as offering the best gluten free tapas on the island! Cas Consol – the staff here can talk you through the various gluten free options available. 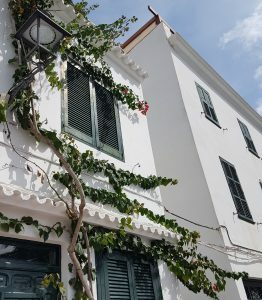 Fang i Aram – a vegetarian restaurant with plenty of gluten free options. 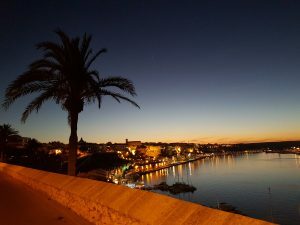 Restaurant Mandi Mandi – on the harbour front, they offer gluten free pasta and Italian food with lovely views. 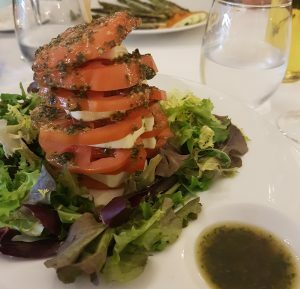 Rels Restaurant – for fancy fine dining with gluten free options. Book in advance as this restaurant is popular and then you can prewarn them about your dietary requirements. 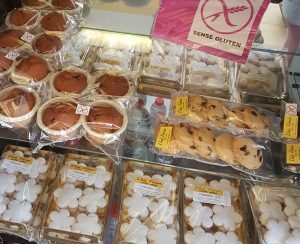 Can Pons – a bakery with a decent gluten free range. Lluis Febrer – a FANTASTIC find. 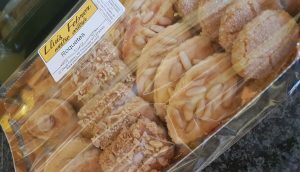 This bakery caters extensively for coeliacs and they have strict measures in place to prevent cross-contamination. I loved being able to try some local specialty cakes. 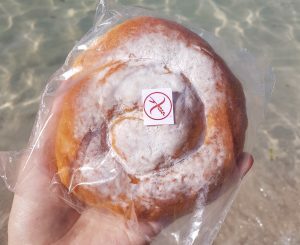 They have gluten free ensaimadas – a Menorcan bun/cake that I could happily eat every day. Ensaimadas have a wonderful texture, a cross between iced bun and chelsea bun dough, with lovely sweet icing sugar dusted on top. Loar – a hotel restaurant, which is advertised as 100% gluten free. Pizza Liorna – gluten free pizza available here. Es Cactus – gluten free options. Sa Gelateria – the island-wide gelato chain that shows the various allergens in each ice-cream on a helpful wall chart. Of course there remains the risk of some cross-contamination from the scooping into cones. If you are super paranoid like me (better safe than sorry) then they also have individuals tubs and other ice creams in the stand up freezer units. Sa Taula – we ate here for lunch and had a very good experience. Staff were very helpful with gluten free and demonstrated very good understanding of cross-contamination risks. They even have a dedicated gluten free fryer and they volunteered this info to me before I needed to ask, which was very reassuring. Clorofil-la – a vegetarian restaurant that had a huuuuge range of gluten free dishes, all marked on the menu. They even had a melt-in-the-middle gluten free chocolate fondant dessert, mmmmm! 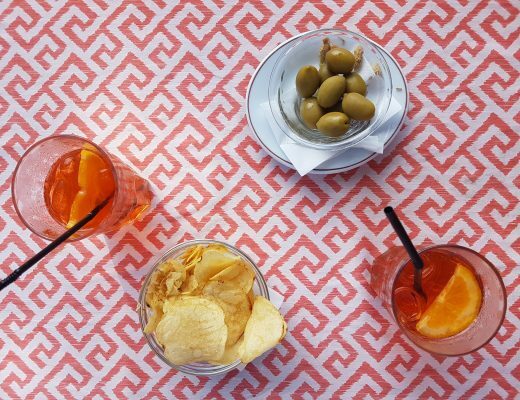 Cafe Mares – a fabulous restaurant with large outdoor terrace tucked away off a side square. The food here was fine dining and tasted excellent, with staff providing an allergens menu upon request. Double check with them about how the fryers are used as on the day we visited a couple of dishes marked as gluten free were not suitable for coeliacs. There are also no gluten free dessert options here. Very nice all the same and certainly worth checking out. 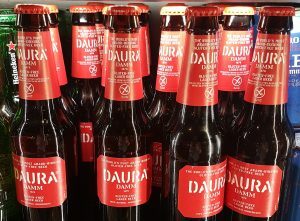 Birra-o-clock – a beer bar that had a couple of bottled gluten free beers when we went in. 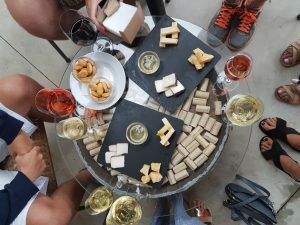 Bodegas Binifadet – Menorca’s major vineyard actually had a great selection of gluten free dishes if you plan on dining here one evening. The main menu was marked up to show choices. We popped in for some afternoon wine and non-alcoholic cocktails (for us drivers) and staff helpfully adapted some of the bar nibbles to make them gluten free. 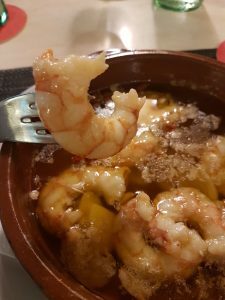 Sant Joan De Binissaida – this restaurant can cater for coeliacs and most of menu can be easily adapted. Good reviews from other gluten free travellers. Alessandros – I spotted that they advertise gluten free pizza on their menu. 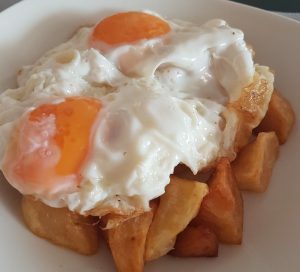 Las Dunas – this restaurant is next to Alessandros and has an absolutely huge range of gluten free choices. All options are marked up on the menu and they had a very wide gluten free tapas selection in particular. Quite a touristy spot, but nice to see such a good offering. 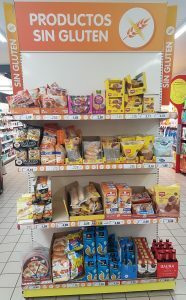 The little supermarket in Son Bou has a number of gluten free products on sale. I found gluten free bread (Schar), biscuits, cakes, crackers and beers. There is no dedicated section, instead you will find them scattered among the standard products. 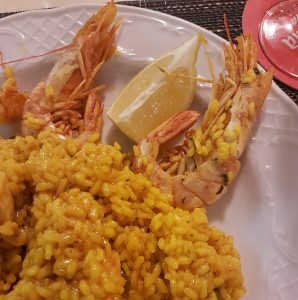 Restaurant Meson Murciano – recommended by Sallie Wilkins on Facebook, a seasoned Menorca coeliac visitor. Sallie told me “practically everything on the menu, pizzas, pancakes you name it, was all available gf as the chefs wife was coeliac”. Sounds like one to check out! 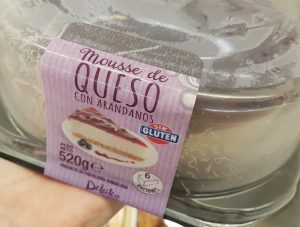 If you are going on a self-catering holiday in Menorca, you will find that supermarkets have plenty of gluten free food on sale. 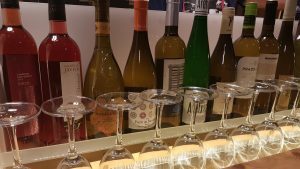 Mercadona – my number one supermarket recommendation is Mercadona. 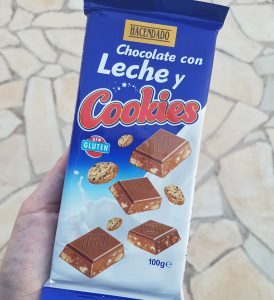 They had a massive range of gluten free products here, including fresh puff pastry, cheesecake, croquettas, calamari rings and cookie chocolate, as well as the usual gluten free products you would hope to find. There is no dedicated section, so keep your eyes peeled as you shop and look out for the crossed grain symbol. 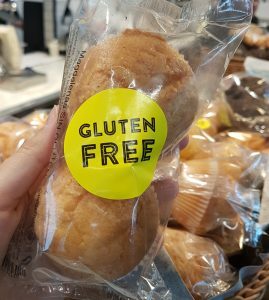 Dia – a more limited selection of gluten free products here, but they do have a dedicated section and stock all the basics. Dino – they also have a good selection of gluten free products. Look out for the yellow packaging. Eroski – another supermarket with a strong gluten free range. 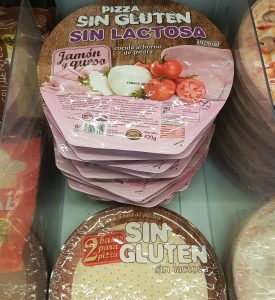 The gluten free Menorca airport options are limited. I only spotted gluten free cake and gluten free beer, hence I recommend taking some food with you. They do advertise gluten free sandwiches at Pans, but I was not convinced on the cross-contamination measures. I would advise coeliacs to steer clear.